in a loop and loop was working only when I was touching this pin or I was touching the cable (isolated!). I thought that maybe I got faulty board, so I bought second Arduino Nano but the effect was the same. Then I bought other HR911105A board, now 17/20 (does it make difference?) and results are the same. What may cause such strange effects? I thought it would be simple. Just a hunch: the Arduino Nano operates at 5V logic levels, but the ENC28J60 can only handle up to 3.3V, if I remember correctly. For the first board I used 3.3V as on a schematic. On next board there is 5V label instead of VCC so I connected to Arduino's 5V pin. Results are the same on each board. It feels like the responses are not being received from the ethernet card. Since you have replaced the Nano one wonders about the ethernet card. Do you see any LED activity on the ethernet card? 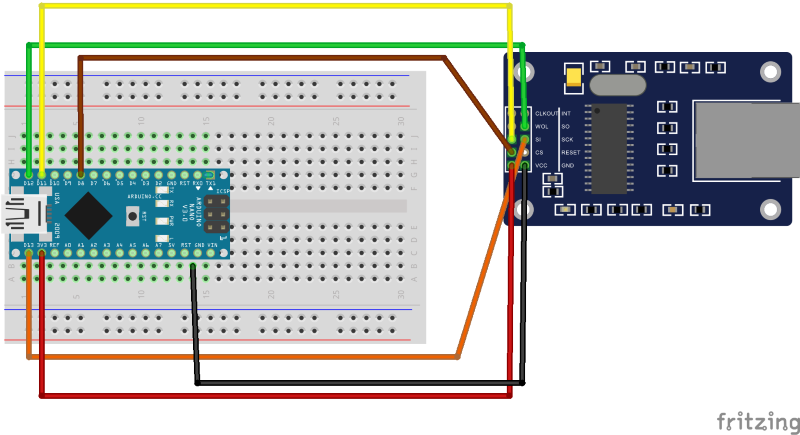 The picture you have posted doesn't make it crystal clear which connections are connected to which Nano pins as the breadboard seems out of alignment by half a pin. Perhaps a photograph will reveal more. On EthernetCard LED light lights all the time, no blinking. I'm sure it hasn't connected with Nano. That's power. But the output pins on the Arduino also produce 5V for "1" outputs, which is too high for the ENC28J60. I'm not sure this is the problem here, but you're putting an over-voltage on the Ethernet chip, which can damage it. I've seen succesful (working) projects on the Internet with connections as listed, so I'm not sure it is wrong in that case. While looking for something else I found this device, does it look anything like your unit? A few resistors on the board, I wonder if they are doing the 5v to 3.3 level shifting for us. Yes, this is something like this.